Level (One) | The Arcade Archives! Welcome Arcade Archivers! Sirluna here with a little segment I like to call “Level”. One level, and why it’s so significant in my opinion, will be covered on a bi-weekly basis. Have the music for the stage play while you enjoy reading. The track brings forth an ambiance to the stage. It almost reminds me of Adventure Time. For the first level that I would like to highlight is the Slimy Spring Galaxy from Super Mario Galaxy 2 for the Nintendo Wii. Quite possibly my favorite water stage to date. 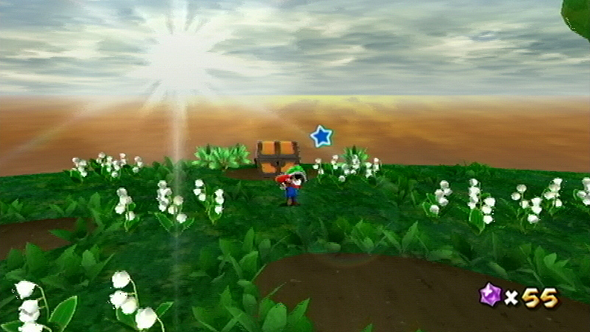 If you played a 3D Mario game before, you know the name of the game, collect Power Stars and move on. So upon looking at the level in the level select, what came to mind was that it’s just another water level in a cave. Upon entering the galaxy, a slide is there to take you to main section of the game, consisting of tunnels filled to the brim with water. The green koopa shells laying around will help propel either Mario or Luigi faster, for access to air is very limited in the long tunnels. The final incline may prove to be quite frantic, that is, if you lose the shell to the urchins that roll down the hill and happen to be short of air at that point. The music comes to a complete halt the higher you go. Once you’ve finally reached the surface, you’re welcomed to the main reason why I’m highlighting this level in the first place. The tension created by the potential of drowning had been lifted. The first thing you see when you make it to the surface is the sun shining out in the outset. The grass and flowers appear lush and vibrant. The music that played previously is replaced by the sounds of birds chirping. A lone treasure chest stands between you and the Power Star. With one quick toss of a green shell, the chest opens and out comes the lonely leader of the Toad Brigade, rewarding you with a star, given as thanks for rescuing him. It’s the simple things in games that get to me and this level is no different. Stay awesome and I hoped you enjoyed the read. This entry was posted in Archive Entries and tagged Boos, Level, Luigi, mario, nintendo, Slimy Spring, Super Mario Galaxy 2 by sirluna. Bookmark the permalink.